Especially for the last week of my department's biggest loser competition. I don't think I'm going to lose tons of weight in one week so I'm going to set a personal goal. By July I would like to be 126. I think that gives me plenty of time. So Dave and I went to New York City this weekend. We left early Friday morning after a VERY busy work week. I worked until 8:30 every night this week so taking Friday off was well deserved at least in my opinion. Thursday evening, the president of our company came down to check out a video I've been working on for the MSPCC foundation. She kept saying it was "perfect" so I am really excited about that. And I really felt like she knew who I was which was exciting!! So going into this week, I have one new project to start and finish, two projects I've been working on that need to get done and a project that I am taking over for the freelancer that has been working here the last couple weeks. I'm excited for the last project- its something different and I think it will be a lot of fun! Here's to an exciting week. One in which running is part of EVERY DAY no matter what! Needless to say, I wasn't able to run Wed due to work and Thurs was such a crazy day that I was only able to get two miles in before going back to work. And I ran FAST! Once Dave and I got settled at the hotel, we went for a walk and ended up at ESPN Zone to get a quick drink and salad. We had dinner reservations at Good in the West Village with my friend Meghan and her boyfriend but not until 8:30- which is late for Lizzy!! After our quick bite, we got ready to go meet up at Meghan's apartment. We got there around 8 and enjoyed some wine and then walked to the restuarant Good. It was GOOD! haha. I had a couple drinks there and fish tacos that were amazing!!! I forgot to take pictures tho. After dinner, we walked to a local bar and watched some college basketball. I'm not doing so well in my bracket. I ordered another drink there- Pear Vodka with Tonic Water and Cranberry. It was so tasty!! I was definitely starting to feel it by that point. My best friend from college, Debbie met us around 11 and we hung out for one more drink and then walked to another bar that was 4 avenues away (that's kinda a lot in NYC!) The bar was super crowded so we didn't stay very long. Debs, Dave and I said goodbye and we went home around 1:30. Kinda early for NYC but late for me! Saturday was a CRAZY busy day!! We first met Debs on her side of NYC in the Upper East at a place called Vinyl. And it was David from the first season on Top Chef's restuarant! It was good! I got an egg-white omlette with goat cheese, spinach and bacon. Totally an oxy-moron- bacon and eggwhites but you gotta cut calories somehow! Debs also gave me half her whole wheat bagel with cream cheese. God, I love bagels and wish I could eat them everyday!!! After brunch, Dave and I walked to Central Park. It was a gorgeous New York day. High 60's and just beautiful. Central Park was so crowded and there were so many runners! Made me want to get out there! After our walk, we went to the Met and viewed pretty much every exhibit they had there. I think Dave could live there. I got bored at hour 2. Then we took the subway to 34th street to be extreme tourist and go to the top of the Empire State Building. We got there around 3 and didn't leave until 5:30. The lines were INSANE. But the view was pretty incredible from the top. After we left there, we grabbed some nachos at the local brewery and then we headed to the Top of the Rock. Dave bought tickets for us to view the city from Rockefeller Center and it was really nice. We watched the sunset and saw views from all over the city. Then we went back to our hotel and got ready to go to dinner at Blue Fin at the W Hotel. I got the Blue Fin Martini which was blue with a floated Swedish Fish. DELICIOUS! We also shared an appetizer roll of sushi made of pineapple, fillet mignon and veggies with a teriakki sauce. For dinner, I got salmon with brussel sprouts, pearl onions and bacon with a grainy mustard sauce. The server asked me how I wanted my salmon cooked and I wasn't sure what to say so I said "medium?" If this ever happens to you, say WELL DONE. Parts of my salmon were raw and I couldn't eat it but it was okay because it was a huge piece and I probably wouldn't have been able to finish anyway. On Sunday, we met Debbie across town at a Scandinavian Brunch spot. I got the salmon egg-white omlette with goat cheese and toast and lots of coffee. It was tasty and really good to see Debbie again! After we did a tour of NBC Studios which was really cool. We got to see where they shoot the Nightly News and Saturday Night Live. The SNL studios is really small and they said is virtually impossible to get tickets too. You have to get in the raffle and I am totally going to apply for it this year!! After the studio tour, we walked to the Carnegie Deli to get some really good hot pastrami! I got a bagel with cream cheese and Dave got the hot pastrami sandwhich which we shared. It was ENORMOUS, you couldn't fit it all in your mouth!! Sooo good though. After the deli, we went to get our car and drive home. There was a bunch of traffic, but we got to metrowest around 6:30, did some quick grocery shopping and then went home and now here I am! I'm about to unpack and get ready for a busy day tomorrow. I hope to make it to the gym in the AM and get in a REALLY long run. Good night everyone!!!!!!! So another busy day at the office. Dave and I woke up late yet again so I got ready in 20 minutes but still made the express train and got into work by 8:30. Not too shabby. Before I left, I had toast with my fake butter and coffee with creamer. Oops, I might have taken a bite before I took the picture. Around 10:30 I had a mid morning snack of Oatmeal and a spoonful of White Chocolate Wonderful Peanut Butter. This basically means that I will have to run 6 and 10 Wednesday and Thursday. My goal is to run in the AM tomorrow. Hopefully ten miles. I have a meeting with a client at 2 tomorrow and don't want to be running from the gym. So lets hope I can wake up at 5AM! I got back to work and ate lunch which was the same as yesterday with the addition of a Dannon Yogurt drink. So this week at the grocery store, I couldn't find my normal drink that I get and the closest one I could find was a kids drink. But I didn't want to get the smoothies they make because they are loaded in calories. I think the one I found was pretty funny. And Carissa, my lunch friend, had High School Musical string cheese. We are such dorks! Okay, now off to finish my last hour at work and then sushi time in the suburbs with Dana. I'm excited to spend time with her : )! So David is at the Celtics game and I just got home and decided to go straight to bed to watch TV so why not blog in bed? Today was a really busy day but I was so tired and unmotivated. I worked on three projects today and one I got finished and completely off my plate! yay!! For breakfast, I ate oatmeal and for a mid-morning snack, I had a new flavor Fiber One Bar. It was so tasty! I'm going away this weekend, and most likely won't be able to run, which means I will have to run pretty hard this week in four days. This is my goal: Mon- 4 miles- check, Tues- 6 miles, Wed- 5 miles, Thurs- 10 miles. That would be 25 miles for the week. Hopefully I can do it! For lunch, I ate a Lavish Roll Wrap with Cracked Pepper Turkey, Spicy Cheese, Spinach and leftover of the vegetable salad I made the other day. I usually like to melt the cheese in the microwave but the microwaves were taken over by 50 girls heating up their Lean Cuisines. So annoying! Here's what half my wrap looked like. I was starving and had already ate the other half by the time I got around to take a picture. It's 10 and I'm going to call it a night. Tomorrow night I am going to hang out with my friend Dana and most likely get sushi. We might even have sleepover party. Dave want be happy about that but I miss Dana and she finally has the day off! Just finished watching Gossip Girl and One Tree Hill. xoxo- Lizzygirl! Hi again! Just got back from dinner at my in-laws. It was delicious. But first, here is my excitement from the gym. I'm BACK! I was able to run 8 miles and felt pretty good! I guess I didn't lose too much of my endurance while I was sick. I'm still not 100% but I can't sit around any longer! I NEED to run! And while I was at taking pictures, here's our stocked fridge full of healthy yummy food! We just got home and I am starting to get tired. Dave and I are going to discuss our Europe trip that we may take at the end of the year and then it's Celebrity Apprentice time. It's a pretty painful show but the creative side of the challenges is always fun for me. This is a four-day week for me because I am going to NYC with Dave on Friday for the weekend. Goodnight! When I got home from the gym, I was starving! So I took a half Lavish Roll (50 calories) and melted mexican blend cheese and put some of the avocado dip in it. Arrange the vegetables in a single layer on a tray or work surface. Lightly spray both sides with olive oil cooking spray. Preheat a grill or grill pan over a medium-high heat. Grill the vegetables in batches until both sides are nicely charred and the vegetables are just tender, about 10 minutes for the pepper, about 8 minutes for the eggplant and onion, and about 6 minutes for the zucchini. When the vegetables are cool enough to handle, cut into 1/2-inch pieces and transfer to a large bowl. Crumble Feta Cheese over the vegetables. In a small bowl, whisk together the olive oil, vinegar and oregano. Pour over the vegetables and toss. Season, to taste, with salt and pepper. At the same time, Dave was grilling the chicken and steaks with Brian outside. I also finished the salad. I think I ate the world biggest piece of Steak. But I didn't eat the chicken because I was so full. I also had three glasses of Prosecco and I'm telling you, I was kinda drunk! It was a delicious day of food! Now I'm off to work it off! Let's hope I can do 8! Add a bit more ketchup to the top and bake at 400• for 35-50 minutes. God I love Spinach!!! We just watched BC lose : ( and now Dave is watching the Celtics. KG is back in the lineup!!! Okay so the day was pretty good. This morning I went to Soundtrack- the place where we mix our commercials and videos and record Voice Over Talent. I don't usually go, but decided to get out of the office and plus there was some music challenges I wanted to explain to the sound engineer about my cut. It was a Brand Essence Video for one of our existing clients. Which basically means, its a video for the employees at the company to explain the new campaign/direction our new commercials are going in. So I was there until about 12:30, then I went over to the gym for my run. I was supposed to 4 but I kept feeling like I had to be back in the office, so I only did 3. Tomorrow and Sunday I am going to have to 12-14 miles. My plan is to run as long as I can tomorrow on the treadmill and then try to run outside on Sunday. I'm not completely healthy but I can't sit around waiting. Oh my other exciting news of the day is that I lost a pound this week for the Biggest Loser Competition! We only have two weeks left! We'll see how I do. I would like to end at 128ish because then I will have lost 10 pounds which is 7.24%. We'll see if I can do it. I ceretainly won't win, but I would feel pretty good! Okay, I am off to bed. Not a Crazy Day YAY!!! 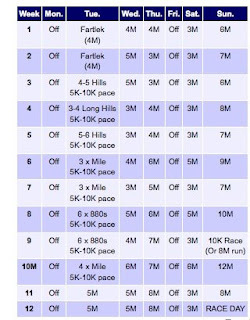 I just looked up a training schedule for a Half-Marathon. However in 3 weeks, I am running a 15K and in 10 weeks I am running a Half. So I am going to modify this schedule a bit. Starting today, I am going to run every chance I can and follow this schedule as much as possible. I'm still pretty sick but I ran today on the treadmill and felt fine. I just did 3 miles but I was able to do it at my normal pace- maybe a little slower. For the training for my 15K, I am going to start on week 5 and today I did Wednesdays run. This will be fun to have something to follow! Okay, I am going home now. Going to eat leftovers and hang out with Courtney! Dave is going snowboarding. Forth day in a week I've been at work longer than 10 hours. I'm getting exhausted! But I love being busy. I think I've gotten pretty good at multitasking and juggling multiple projects at once. I worked on six different clients today and 8 different projects. For breakfast, I had a piece of toast with "I can't Believe it's not butter" and some coffee with my hazelnut coffee creamer. Around 11, I ate one of those trader Joe's bars. For lunch, a few of us were taken out for sushi to thank us for a video project we did back in December. The project was fun, but had a tight turn around that ended up making us work on days between Christmas and New Years that other employees had off. It was really nice that we were invited to lunch! We went to Sakurbana in the Financial District. We shared a bunch of sushi and I got a salad to start. I had eaten most of it before I remembered to take the picture! I then cooked the chicken in a saute pan before transferring them into the oven to finish cooking. While the chicken was cooking, I made aspargus. I sauteed it in a pan with a tiny bit of Olive Oil, Salt and Pepper and Lemon Juice. I also boiled some water and peeled my Yukon Potatoes to make Mashed Potatoes. When my pototoes were done cooking and ready to mash, I drained them and put them back in the same pot. I added a little light cream, spinach, soy mozerella cheese, parmasian cheese and salt and pepper and I mashed the potatoes which is by far one of my favorite activities in the kitchen! I also made Pea Puree. I saw this side/sauce in my Women's Health magazine and since Dave LOVES peas, I thought it sounded interesting. I used frozen peas and steamed them. Once slightly cool, I added them to the food processor with a little bit of ginger and a lot of water. This was a nice addition to the dish. Here's how the whole thing turned out on the plate! At half-time of the Celtics game (we DVR'd it), Dave and I did the dishes together. He washed, I dried. And now its about that time! Either I watch Damages or go to bed. I should go to bed but I have a feeling I'll be up for awhile. ...ooo and no workout today again. I am going tomorrow during lunch no matter what. The Birth of Courtney Lynn Leahy!